It's said that Harley Earl, director of GM styling, got the idea for a GM concept car while watching world speed records being set at the Salt Flats in Utah. It would be a sports racer called a Bonneville Special. 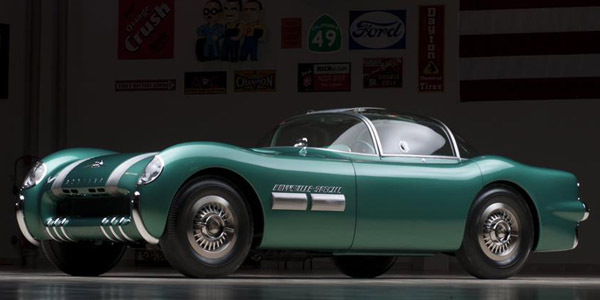 That was when 1954 models were being readied for production, and no GM car had ever carried the Bonneville name. Perhaps Harley Earl gave the assignment to Pontiac as the birth of its upcoming performance image. Under the direction of Earl, Hommer LaGassey and Paul Gilland were directed to build two Bonneville Specials. The bronze car would debut in the Grand Ballroom of the Waldorf in New York and the green one in the Pan Pacific Auditorium in Los Angeles. The green model would later tour major dealerships around the country. The cars were showbiz and beyond production, but realistic enough for the public to identify with them and make them contenders for best-remembered Motorama cars.